*Disclosure: I was not compensated monetarily for this post. I have received complimentary product and gift card. All opinions are my own. The experts at LongHorn Steakhouse have been offering some great tips to help you up your grilling game this season. They've hosted two grilling hotlines - over Memorial Day weekend and 4th of July weekend - to answer questions related to grilling. They've hosted Twitter parties to open discussion and help answer more questions and offer more suggestions on great ways to grill, along with giving away some great prizes. They've even kicked off a microsite, ExpertGriller.com, where you'll find recipes, take a quiz, enter a sweepstakes, watch videos and access more tips and tricks. 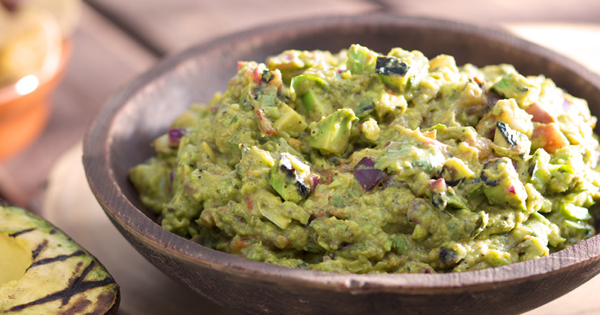 One of the recipes you'll find on the site is the one below for Grilled Guacamole. Avocados are a trendy super food that you'll find on salads and in dishes all over the place these days. One of the most common ways to use avocados is in a classic guacamole. This recipe takes it a step further by grilling your ingredients before you mix them all together. I made a batch of this the other day to go with some chicken and salsa we were having for dinner. Grilling the avocado, tomato and onion for a just a few minutes really enhances the flavor! Next time you have a hankering for some guac and chips, try it out the LongHorn way! Also, to celebrate grilling season, LongHorn Steakhouse is offering one of our readers a LongHorn Steakhouse Summer Grill Party Pack. The pack includes various grilling tools, koozies for your outdoor grill-out and a $25 gift card to visit LongHorn Steakhouse. The giveaway is sponsored by LongHorn Steakhouse. Scroll down to enter! Giveaway begins at 12 a.m. on July 8 and ends July 15 at 12 a.m. Good luck! • Oil your grill grates with a spray bottle or hand towel dipped in canola oil. Heat to 400 degrees F.
• Cut all vegetables and lightly spray with oil. • Place all vegetables on a well-oiled grill, cut sides down. • Grill until you see grill marks, about 2-3 minutes. • Carefully remove the avocados and set aside. • Flip the remaining vegetables and grill another 2-3 minutes until lightly browned/charred. • Remove all the vegetables. • Scoop out the avocados with a large spoon and dice 1⁄2 cup. Set aside. • Rough chop the red onions, jalapeños and tomatoes (reserve 2 tomato halves to blend). • Remove skin from avocados. Place into a food processor with 2 tomato halves and lime juice. Blend until smooth. • Add avocado mixture to mixing bowl and add in all remaining ingredients (other vegetables, cilantro, cumin, salt). • Gently fold with a rubber spatula until well blended. • Taste and add salt, as needed. • Cover with plastic film (press into the guacamole so it doesn’t brown). Chill for 30 minutes in refrigerator. • Serve with chips or grilled pita bread triangles. My favorite food to grill is steak... It is sooo delicious! I love to grill pizza! There is nothing better than homemade grilled pizza. I love to grill chicken! My favorite is chicken and vegetables.